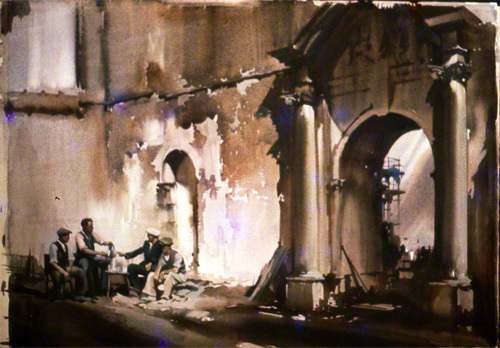 The painting shows the restorations of a church with the workman, having a tea break. The back drop to the picture is the interior of the church showing the stonework. Central to the picture is the fine coliseum of the entrance of the church. There are various objects scattered about suggesting that repair work is going on. Claude Buckle makes the painting in water colour seem easy with a fine architectural style. Created in 1967.